By now you’ve probably heard about barre workouts—you know, the ones where you shake, tuck, and burn your way to a more toned body. Well, there’s a lot more to a barre workout than simply slimming down and fitting into your favorite pair of “just in case” pants. Barre is a physiologically balanced workout that trains strength, flexibility, and cardio-respiratory endurance by using the principles of interval training. It’s great for cross-training, but it’s also great ALL. BY. ITSELF. Mind-Body Connection – If I told you to activate your hamstrings right now, would you know exactly which muscle to engage? For most people, the answer is—probably not. That’s because when we perform repetitive movements like walking or climbing stairs, our muscles fire automatically. Meaning we don’t have to think about engaging them for them to engage. Barre workouts are laser-focused on improving the connection between the mind and body by putting a strong focus on the breath while engaging specific muscles of the body. Why is this important? A strong mind-body connection helps you to feel subtle changes in your posture (and be able to correct them) throughout the day, which means less injury, muscle pain, and strain. Core Strength – barre puts a strong emphasis on form and alignment. It doesn’t matter how many reps you can do or how heavy you can lift, if you aren’t doing it with proper alignment. Why?! Because incorrect form puts you at increased risk of injury. Think of barre as a 1-hour intense core training session. Every. Single. Movement. is focused on core stabilization through holding correct form and intense muscle engagement while performing tiny movements that tax the muscle. Flexibility – got tight hips, hamstrings, or shoulders–Who doesn’t, right?! Tight muscles are less efficient, more prone to injury, and don’t see gains in strength or endurance as quickly as more flexible muscles. Barre focuses on joint mobility by stretching each muscle after its warmed up by an equally important strengthening sequence. 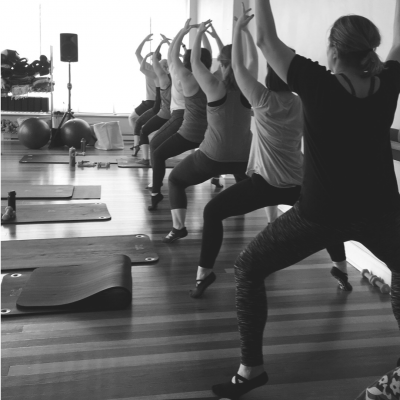 Barre class focuses a lot on the hip complex—connecting stability in all the stabilizer muscles with range of motion. This balance of strength and flexibility helps the muscles work more efficiently. So, combine the factors above with the interval training style—think several minutes at a time of intense, heart-pounding work, followed by long stretching intervals–used to deliver a barre class, and you’ve got the recipe for one of the most balanced workouts available right now. Barre is effective cross-training if you regularly do another workout or it’s the perfect workout all.by.itself. if you’re searching for a high-energy, efficient workout that literally never gets boring.